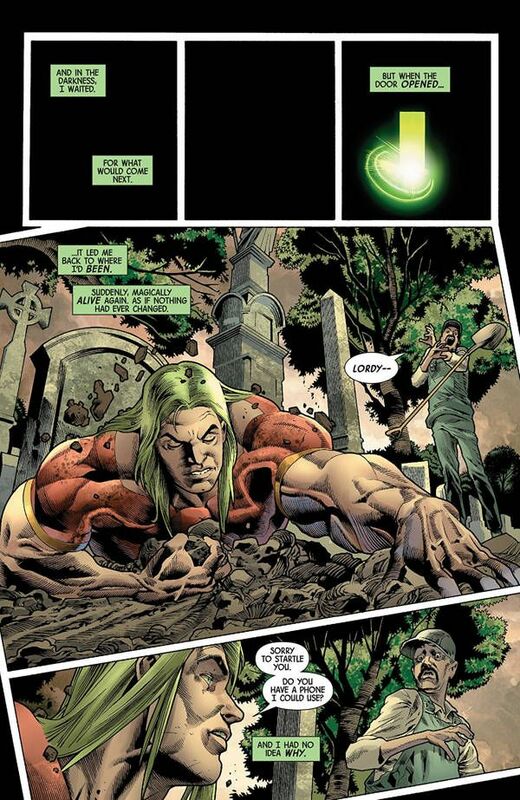 After everything the Hulk has been through, can Doc Samson possibly put him back together again? The two square off in a gamma-infused battle, where Doc will have to reason with a green goliath with a literal hole in his head. Half of his face has been blown off by an assassin's bullet. Yeah, things have been better. I will never get tired of artist Joe Bennett's depiction of the Hulk. He manages to show the monstrous and human sides of the character in equal measure. Yes, he's done some horrible things, but there's a reason for it. He works to protect Bruce Banner in this almost noble way. He does what Bruce cannot or will not. Bennett weaves some truly horrifying elements into The Immortal Hulk. The hole in the Hulk's face is rather chilling. It gives way to the character's baser instincts, as he is missing a chunk of his brain. Without any semblance of intelligence or reasoning, he defaults to a more primal feeling, lashing out at Samson. There are some great shots of the wound as it slowly heals, adding just a pinch of body horror to the mix. This monstrous quality is amplified by letterer Cory Petit. The Hulk can't form complete sentences here. Instead he's letting out some growls and animalistic sounds that burst off the page. They can't be contained in simple word balloons, breaking their boundaries with large, jagged letters. Ruy Jose's inks highlight the raw power on display here. The Hulk's muscles bulge with intensity. Veins pop out as he clenches his fists, ready to strike. There are hundreds of small lines across his body, giving him an appearance of a shadowy figure. The inks really complement Bennett's work. 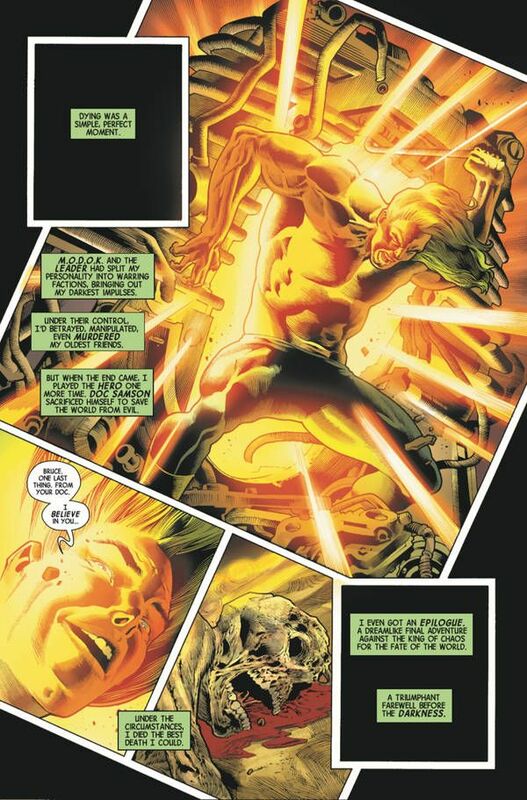 Bennett's layouts are dynamic during the fight scene, creating the feeling that this battle is so large that it's shaking the very foundations of the comic page. The panels are in varied shapes and are often shown at odd angles that add to the chaos of this knock-down, drag-out fight. When the Hulk regains his senses, everything rights itself and we're back to a more traditional layout. Colorist Paul Mounts creates a cool, somber mood with these scenes, with some blues and greys in the evening. It's amazing to see a moment of peace with a character made of chaos and destruction. It makes for the perfect setting for this conversation while also lulling you into a false sense of security when the rug is pulled out from under you by the end of the issue. 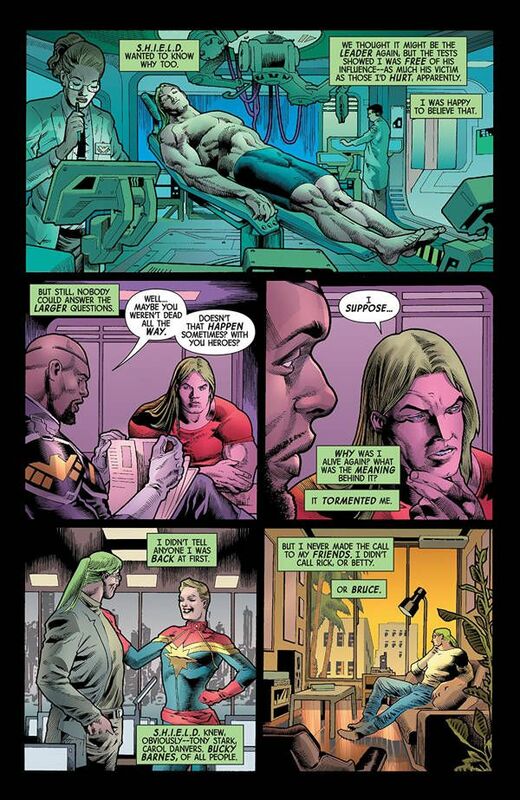 Writer Al Ewing continues to dissect the Hulk, getting into what makes him tick. 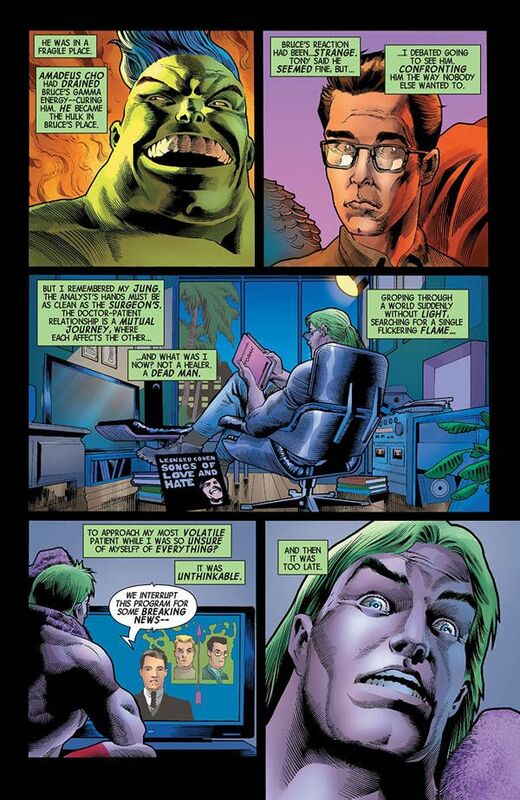 What better person to bring that out than the psychologist Doc Samson? We get the fun fight between the two and then an introspective conversation that digs deep into the inner workings of the Hulk, while reframing everything that's made him the man – or monster – he is today. A simple conversation between two guys might not sound exciting, especially following such a great battle, but it is absolutely riveting. The Immortal Hulk continues to show why it's one of the best comics on the stands today. It can seamlessly bounce from a huge fight scene to a few moments of reflection while catapulting the plot forward and developing characters that have been around for decades. It is an impressive book that never disappoints. From the looks of things, it's only getting started.